"That's easy with cd $TARGETDIR; convert -adjoin *.jpg *.JPG *.jpeg final.pdf"
Err.... why not providing a nice desktop integrated GUI? 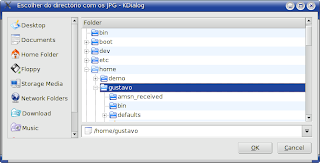 KDE provides a way to present the user most of the dialog boxes directly from the shell. It's called kdialog. It is very useful and incredibly simple to use. kdialog --error "Error connecting to server0.intranet"
KDialog provides a flexible interface for presenting KDE Dialog Boxes directly from the shell. Any magic script can interact with end users in a way the matches your desktop. It is used on the AMSN KDE integration. The equivalent tool for GTK is zenity. It works in much the same style.